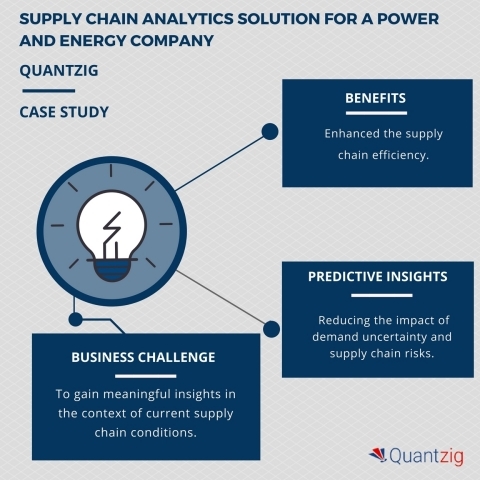 Quantzig, a pure-play analytics solutions provider, has announced the completion of their latest supply chain analytics on the power and energy market. The client wanted to gain meaningful insights in the context of current supply chain conditions. Over the past few years, the global energy market has been caught up in a storm of transformational disruptions. In the global energy market, the technological advancements and operational enhancements have been relatively narrow; thus, creating limiting efficiency gains. However, in recent years, advancements in technology have started opening doors to wider operating margins. The supply chain analytics solution helped the client in the implementation of a robust solution to enhance responsiveness by offering real-time supply chain information. The solutions also eased the interpretation of trends by presenting the historical data in a comprehensive package.